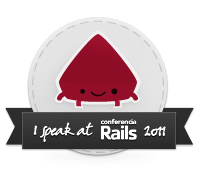 This entry was posted on March 31, 2011 at 6:37 pm	and is filed under aspgems, development, javier ramirez, madrid, ruby on rails. You can follow any responses to this entry through the RSS 2.0 feed. You can leave a response, or trackback from your own site. Fantastically beneficial thank you, I’m sure your followers may perhaps want considerably more well written articles along these lines maintain the great effort. to I could get it too load correctly. I had been wondering if your web hostring is OK?